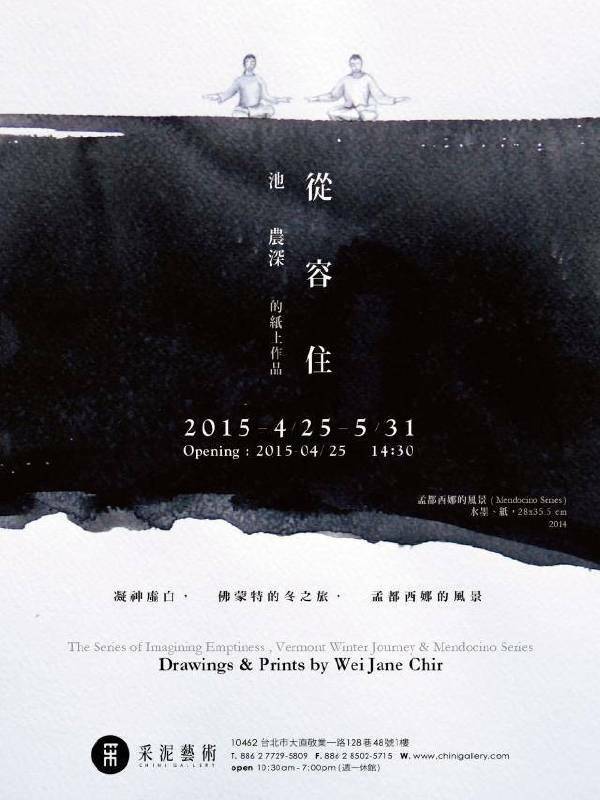 Carefree Living - Drawings & Prints by Wei Jane CHIR is an individual exhibition by the Taiwanese artist Wei Jane Chir. After living outside Taiwan for many years, she is giving an exhibition at the Chini Gallery. The three series of work exhibited embody the artist's life experience and shifts in spiritual aims in different artistic forms. In the Imagining Emptiness Series, Wei planned to produce a copperplate engraving through photography, corrosion and etching. Expressing the artist's forceful intention to explore - exploring the possibility of kneading Western and Eastern aesthetics together through choice of medium. The Vermont Winter Journey Series feature ordered straight lines being used to construct an abstract aesthetic vocabulary, expressing the artist's internal feelings towards Germany in condensed form in a rational way. The Mendocino Series is the artist's latest creation, in which ink which has been exposed like a photograph is used to construct the artist's internal landscape, a response to the minuteness and humility the individual feels in nature. In copperplate engraving, ink painting and pencil sketches alike, Wei displays an inseparable Eastern sentiment through her own reflections on creation and life which cannot be faked. Honesty still remains the heart's guiding light, and such a light is the root of all calm.